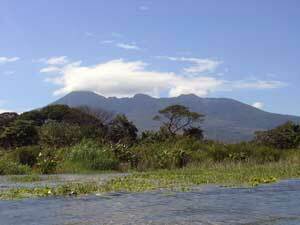 This volcano, situated within the Volcan Mombacho Natural Park, is 1400 meters high. It's been extinct for many years now, and it is totally covered with vegetation. A rich ecosystem has grow over it that now house 50 species of mammals, 174 species of birds, 30 of reptiles and 750 species of flora. You can reach the top by foot or with a special tracks with double traction. A scientific laboratory, a small museum and a restaurant have been built on it's peak. It is possible to set off on various well marked tracks which edge the main extinct crater. Typically interesting are the natural sounds which are amplified by the crater. Along the tracks, round holes can be found, from which hot water vapour is released. You can also find "mirador" to stop for a break at to admire Cocibolca lake, Apoyo lagoon and the city of Granada. An interesting experience, which takes place on the escarpments of the vulcano, is the Canopy Tour.